This holiday season has been one of the most exciting, at least for me, blogging every other day on a giveaway or a special season-only deal. Software giant, Microsoft, rolled up its sleeves and brought in a nice surprise for the people looking forward to buy a smartphone powered by the Windows Phone 7 Operating System. Even though the handsets are not yet available worldwide, customers who have access to Windows Phone 7 devices on their local market, should strongly consider making a Windows 7 OS powered smartphone as the handset for this season, since these handsets are being offered with a special deal this holiday season. Microsoft made the announcement official, after the tech giant flagged the Windows 7 Redemption. The company is offering a free Xbox 360 game for those customers who are considering on buying a new Windows Phone 7 device. Upon purchase, users would be able to choose to a receive a free game from a choice of four titles. 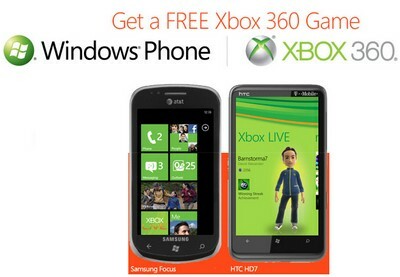 Just in time for the gifting season Microsoft is making a special offer, buy a Windows Phone and get a free Xbox game to go with it. When you buy any Windows Phone 7 you can pick either Fable 3, Halo Reach, Kinectimals or Kinect Joy Ride, some of the hottest games this holiday.